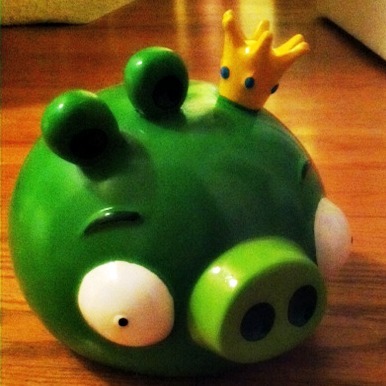 Home Parenting	Teaching kids financial responsibility with Virtual Piggy! Oscar got a piggy bank as a gift a couple of weeks ago. He loves it because it’s an Angry Birds pig. But he also really enjoys putting money into it! Right now he simply comes to us and asks for money. He has no concept of amounts or the difference between a quarter and a penny so if we can find some change, we simply hand it over. One day last week, we didn’t have any change on hand so we had a little conversation about the nature of money and how we don’t just have it laying around. That we have to earn it. We talked about working for money and I think a little bit of the lesson stuck with our almost four year old. He’s still pretty young so we don’t have allowances yet. But the little piggy bank is a great start. We want to teach him financial responsibility, not just with spending, but with saving and giving to those less fortunate. This year, we are donating some of our toys to less fortunate families. Oscar helped me choose some of the toys and has since brought up that experience a couple of times. My hope is that he will save a little bit of money in his piggy bank and we’ll take him to the store to let him spend it, knowing he will have to start saving all over again. I think kids learn best by doing, so I don’t just want to hand over the credit card. I want him to see the money and watch it change hands. I think that makes the whole financial responsibility thing come to life at this age. However, when he’s a little bit older I’d love to set him up with a Virtual Piggy account where he can actually do his own online shopping through preferred vendors. As the Parent, I would set up the account and his spending allowance, and he would be able to shop and order on his own without ever needing to put in mailing info or credit card. There are tons of Parental controls you can set ahead of time, or even require to approve every purchase. I believe that part of teaching financial responsibility is allowing a little bit of freedom. But in this digital age, there also needs to be a safety net. I’ll admit, that at fist the idea of letting my child order something online seemed a little scary. But at the appropriate age and within our own set guidelines, I think the lesson could be really cool! You can even get great deals through their MVP discounts. If you want to learn more about Virtual Piggy, check out their Twitter party TONIGHT at 9pm EST using the hashtag #virtualpiggy. Learn more, check out the prizes and RSVP here! Disclosure: This is a sponsored post from Splash Creative Media on behalf of Virtual Piggy. All opinions are my own.